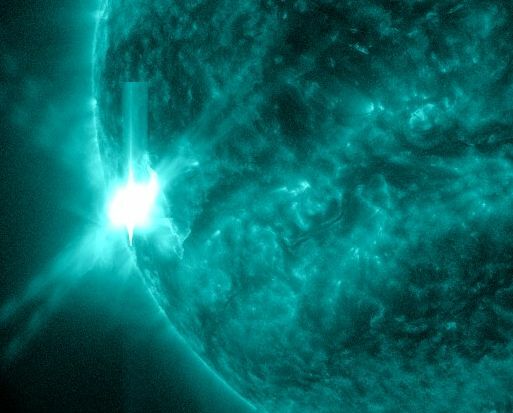 For 3 days sunspot AR2297 has produced eruptions of solar plasma. Today a powerful M9 flare proved this sunspot has lots more to say. Radiation (able to reach our planet within 8 minutes ) swiftly impacted HF radio frequencies over the Pacific Ocean. Few people would notice blinky radio signals, Auroras are an entirely different matter. Envy can’t begin to describe my dismay over residing outside the Auroral Oval – that sweet spot where Northern Lights dance with wild abandon. Yesterday found me grumpy over a CIR, (co-rotating interaction region) alert – transition zones between slow and fast moving solar winds that pile up solar plasma and spark auroras when impacting the magnetosphere. As if that wasn’t enough, AR2297 unleashed a M9 in case I wasn’t paying attention. All I can hope is to live vicariously through those lucky enough to fall under Aurora’s spell. This is the weekend to welcome Aurora. March 7, 2015 M9 class eruption captured by NASA’s Solar Dynamics Observatory.